Movie Ramble: Acts of Godfrey. Johnny Daukes at the RBC. On Monday 19th March 2012 we had a rather special evening at the Robert Burns Centre Film Theatre Film Club. The director of that night’s film Johnny Daukes took part in a question and answer session following a long journey up from London. Mr Gordon Simpson an ex-colleague of the late Darren Connor had volunteered to chair the discussion. So after a brief introduction, the screening of Acts of Godfrey (2012) and our normal coffee break the audience returned into the auditorium to hear an amusing and enjoyable Q&A session. Johnny played guitar and sung in a British alternative rock band formed in 1993 called Fin achieving some success with a single called Headstrong, which was financed by money received from the BBC, after they used a video clip of a previous Fin song in the Irish television film directed by Stephen Frears based on a version of the Roddy Doyle novel The Snapper (1993). The band toured regularly including support for bands as diverse as Tindersticks and The Cranberries. Their debut album Positive was well received by critics but did not sell well and the band split in 1997. In 2008 Johnny returned with a new band All Our Good Friends, who were very much involved with the score for tonight’s film. Two years prior to this he was the creator of The Message a surreal comedy series that spoofed current practices in the television industry. Originally its six episodes aired in 2006 on BBC Three. In 2010 Johnny wrote additional material for Critical Eye a short film directed by Dan Nathan about an TV film critic who's made a career out of making scathing comments on mainstream movies. Acts of Godfrey (2012) is a low budget black comedy and Johnny Daukes debut feature film. It’s something completely different mainly because he’s written it entirely in rhyming couplets using modern day parlance, the first twenty pages were written in a coffee shop in Glasgow! Godfrey, in case you were wondering, is the narrator of the story, whose normal day job is God Almighty someone Johnny was not afraid to cast as a buffoon and unusually for God, someone who on occasions ‘makes it up as he goes along’. The story that Godfrey relates revolves around Vic Timms who attends a motivational sales training weekend where the subject is “win, only win”. Also attending the conference is what can only be described as a bunch of selfish ne’er-do-wells who all want to polish their money grasping skills. There’s Jacqui a bleached blonde who sells Spanish villas to gangsters, Terry and Phil two East End hard men who are promoting a very unusual product as medical reps and the rather meek Gita who works in a funeral home. Then there’s the evil calculating fraudster Malcolm and let’s not forget the lovely Mary Macdalen who has one of the best lines in the film. The movie has a very strong British cast who were initially chosen because of there capacity to handle the rhyming verses, these include Simon Callow, someone that Johnny informed us did not need directing, who plays Godfrey/God, he just explained what he wanted and Callow got on with it! The comedy side of Harry Enfield, who plays Malcolm, had to be reigned in a little because the director required the situation to be funny, and not the characters. Harry came on board because he was the next door neighbour of the films financier who showed him the script and the British comedian, best known for his comedy roles on British television, agreed to come onboard. Celia Imrie (Helen McGann) who will be seen shortly at the RBC in The Best Exotic Marigold Hotel (2012) also needed very little encouragement to join the cast. Also involved was the Glaswegian actor Iain Robertson as Vic Timms, Welsh actress MyFanwy Waring as Mary and other well-known British character actors. During the Q&A it was disclosed that there was never any problem getting actors involved in the project and that they all agreed to be paid the basic equity rate. Johnny commented that this is the great thing with most of the British acting establishment, they can appear in a multi million dollar blockbuster one minute and the next in a low budget British movie, being paid the basic rate. 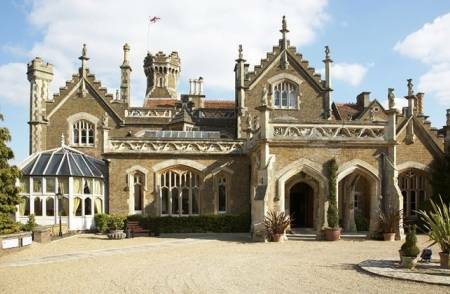 Filming took place at the Oakley House Hotel originally a Victorian Gothic country house built in 1895 with its 35 acres overlooking the River Thames. The exterior of Oakley Court was used in the filming of a number of Hammer horror films including The Reptile (1966) The Brides of Dracula (1962) The Plague of the Zombies (1966) and And Now the Screaming Starts! (1973) But its probable best remembered as Dr Frank N Furter’s castle in The Rocky Horror Picture Show (1975). Although as Johnny explained it was an ideal place to carry out the filming it did however have drawbacks associated with making a movie in a fully functioning hotel including noise problem’s, people constantly walking about, a wake taking place and the Kenny Ball Jazz Band performing! This sharp witty little satire, based on words and characters and not action, mixes elements of dark biting humour with revenge, betrayal and love and proved to be an ideal film for the RBC Film Club because of its fresh approach and new ideas, although its akin to the grand British stage tradition. The film industry does on occasions turn out the same hyped drivel and it really makes a change to have something different and someone brave enough to experiment. The film must be judged on its entertainment value and I for one, after seeing it for a second time, can vouch that this movie is certainly entertaining and the complete cast performs the rhyming couplets superbly, enriching its comedy value. It was a nominee for the British Independent Film Awards 2011’s Raindance Award that honours exceptional achievement for filmmakers working against the odds, often with little or no industry support. Well done Johnny Daukes and thank you for sparing us the time to visit our wee provincial cinema. I would like to thank as always Alec Barclay for providing the photo's.